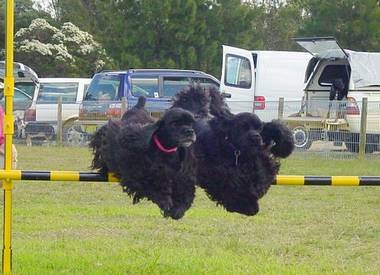 I am very proud of the fact that there are more "LARAMIS" American Cocker Spaniels with Agility titles in Australia than any other kennel. "Sky" (Dual Ch Trucolours Rain Cloud ADM8 ADO JDM4 JDO GDX SDM SPDM) has gained her Masters Agility and Jumping titles, and Masters titles in all 3 of the Games. This makes her the first American Cocker Spaniel in Australia to achieve this level in Australia. In 2006,07,08,09,10,11,12,13 Sky qualified for the NSW Agility Dog of the Year final, and Jumping Dog of the Year final. In 2013, Sky attained the AGILITY CHAMPION title. She is now in semi retirement from agility, and has commenced RallyO competition, attaining Novice, Advance, and Excellent titles in 2014. "Lani" - Ch Tru-Luv's Aloha Laramis (imp USA), began competing in 2008, and despite time out for maternal duties, has gained Novice titles in Agility, Jumping and Gamblers. She is now enjoying retirement from the agility ring. "Kaila" (Ch Laramis Aloha Kailani) is certainly going to test my reflexes and handling skills as she zooms around the agility course. She commenced trialling in 2010, and is currently competing at Masters level. "Keeli" (Ch Laramis Aloha Keeliko Lani) has commenced trialling in Agility and RallyO, with several titles at Excellent level. ......... To date, the following dogs which have been bred here at Laramis have achieved performance titles. CH LARAMIS EMERALD BELLE AD JD - "Emma"
LARAMIS DOUBLE EXPOSURE CD ADX JDX - "Zac"
CH LARAMIS CINDABELLA AD JD - "Cindy"
N.CH LARAMIS BRIGHT SPARK CCD AD JD - "Sparky"
CH LARAMIS VIRGINIA BELLE AD JD - "Virginia"
CH LARAMIS ALOHA KAILANI ADM ADO JDM JDO GDX SDX SPDX "Kaila"
CH LARAMIS ALOHA KEELIKO LANI RE AD JDX GD SD SPD - "Keeli"